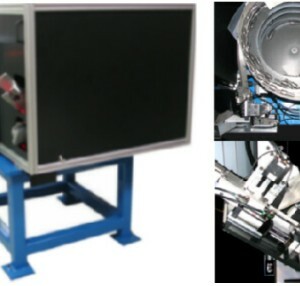 CDS Manufacturing designed and built this LED Journal Diameter Inspection System to automatically inspect the journal diameters of a part produced on a screw machine. The operator loads parts into the bulk hopper. The bulk hopper supplies parts to the vibratory bowl feeder. Parts in the proper orientation are fed down a gravity track to two LED diameter measurement units. The journals on each end of the part are measured. Good and reject parts are gated accordingly and exit the system via their respective output chutes. 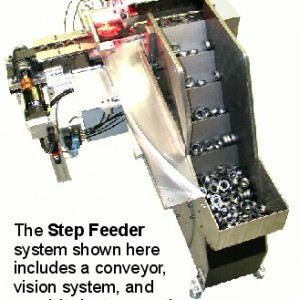 Process Overview Parts are automatically fed via the vibratory bowl feeder to the journal diameter inspection station. The part is presented in the proper orientation in front of the two LED diameter inspection units. Parts that fail diameter inspection are diverted to rejects output chute. Parts that pass journal diameter inspection are gated as good parts and exit the system via the good parts output chute. Optional Equipment Available Yes. Hopper elevator, good parts counter, sound enclosure, machine casters.